Safflower Alcohol-FREE Liquid Extract, Safflower (Carthamus Tinctorius) Dried Petals Glycerite Features and description: ALCOHOL FREE! NON GMO! GLUTEN FREE! Expertly extracted Safflower ALCOHOL-FREE liquid extract! Safflower Glycerite contains ON..
Sage Alcohol-FREE Liquid Extract, Organic Sage (S. officinalis) Dried Leaf Glycerite Features and description: ALCOHOL FREE! NON GMO! GLUTEN FREE! Expertly extracted Sage ALCOHOL-FREE liquid extract! Sage Glycerite contains ONLY natural ingredient..
Saint John's Wort Alcohol-FREE Liquid Extract, Organic Saint John's Wort (Hypericum Perforatum) Dried Herb Glycerite Features and description: ALCOHOL FREE! NON GMO! GLUTEN FREE! Expertly extracted Saint John's Wort ALCOHOL-FREE liquid extract! Sa..
San Leng Alcohol-FREE Liquid Extract, San Leng, Burreed (Scirpus Fluviatilis) Root Glycerite Features and description: ALCOHOL FREE! NON GMO! GLUTEN FREE! Expertly extracted San Leng ALCOHOL-FREE liquid extract! San Leng Glycerite contains ONLY n..
San Qi (Tian Qi) Alcohol-FREE Liquid Extract, San Qi (Tian Qi), Notoginseng (Panax Notoginseng) Root Glycerite Features and description: ALCOHOL FREE! NON GMO! GLUTEN FREE! Expertly extracted, Super concentrated San Qi (Tian Qi) ALCOHOL-FREE liqu.. Sang Bai Pi Alcohol-FREE Liquid Extract, Sang Bai Pi, Mulberry (Morus Alba) Root Bark Glycerite Features and description: ALCOHOL FREE! NON GMO! GLUTEN FREE! Expertly extracted Sang Bai Pi ALCOHOL-FREE liquid extract! Sang Bai Pi Glycerite contai.. Sang Ji Sheng Alcohol-FREE Liquid Extract, Sang Ji Sheng, Mulberry Mistletoe (Taxillus Chinensis) Stem Glycerite Features and description: ALCOHOL FREE! NON GMO! GLUTEN FREE! Expertly extracted Sang Ji Sheng ALCOHOL-FREE liquid extract! Sang Ji S.. Sang Shen Alcohol-FREE Liquid Extract, Sang Shen, Mulberry (Morus Alba) Fruit Glycerite Features and description: ALCOHOL FREE! NON GMO! GLUTEN FREE! Expertly extracted Sang Shen ALCOHOL-FREE liquid extract! Sang Shen Glycerite contains ONLY natu.. Sang Ye Alcohol-FREE Liquid Extract, Sang Ye, Mulberry (Morus Alba) Leaf Glycerite Features and description: ALCOHOL FREE! NON GMO! GLUTEN FREE! Expertly extracted Sang Ye ALCOHOL-FREE liquid extract! Sang Ye Glycerite contains ONLY natural ingre.. Sang Zhi Alcohol-FREE Liquid Extract, Sang Zhi, Mulberry (Morus Alba) Twig Glycerite Features and description: ALCOHOL FREE! NON GMO! GLUTEN FREE! Expertly extracted Sang Zhi ALCOHOL-FREE liquid extract! Sang Zhi Glycerite contains ONLY natural i..
Sarsaparilla Alcohol-FREE Liquid Extract, Sarsaparilla (Smilax Medica) Dried Root Glycerite Features and description: ALCOHOL FREE! NON GMO! GLUTEN FREE! Expertly extracted Sarsaparilla ALCOHOL-FREE liquid extract! Sarsaparilla Glycerite contains..
Sassafras Alcohol-FREE Liquid Extract, Sassafras (Sassafras Albidum) Dried Root Bark Glycerite Features and description: ALCOHOL FREE! NON GMO! GLUTEN FREE! Expertly extracted Sassafras ALCOHOL-FREE liquid extract! Sassafras Glycerite con..
Satiereal Saffron Alcohol-FREE Liquid Extract, Organic Satiereal Saffron (Crocus Sativus) Dried Stigmas Glycerite Features and description: ALCOHOL FREE! NON GMO! GLUTEN FREE! Expertly extracted Satiereal Saffron ALCOHOL-FREE liquid extract! Satie.. Saw Palmetto Alcohol-FREE Liquid Extract, Organic Saw Palmetto (Serenoa Repens) Dried Berry Glycerite Features and description: ALCOHOL FREE! NON GMO! GLUTEN FREE! Expertly extracted Saw Palmetto ALCOHOL-FREE liquid extract! Saw Palmetto Glycerite..
Schisandra Alcohol-FREE Liquid Extract, Organic Schisandra (Schisandra Chinensis) Dried Berry Glycerite Features and description: ALCOHOL FREE! NON GMO! GLUTEN FREE! Expertly extracted Schisandra ALCOHOL-FREE liquid extract! Schizandra Glycerite c..
Scleroderma Care Alcohol-FREE Herbal Liquid Extract, Turmeric Root, Gotu Kola Leaf Glycerite Features and description: ALCOHOL FREE! NON GMO! GLUTEN FREE! Highest Strength Scleroderma care NON-Alcohol liquid extract! Scleroderma care NON-Alcohol ..
Sea Cucumber Alcohol-FREE Liquid Extract, Sea Cucumber (Cucumaria Frondosa) Glycerite Features and description: ALCOHOL FREE! NON GMO! GLUTEN FREE! Expertly extracted Sea Cucumber ALCOHOL-FREE liquid extract! Sea Cucumber Glycerite contains ONLY n..
Sea Cucumber Alcohol-FREE Liquid Extract, Sea Cucumber (Holothuria Atra) Glycerite Features and description: ALCOHOL FREE! NON GMO! GLUTEN FREE! Expertly extracted Sea Cucumber ALCOHOL-FREE liquid extract! Sea Cucumber Glycerite contains O..
Seizure Disorders Care Alcohol-FREE Herbal Liquid Extract, Brahmi Herb, Valerian Root, Passionflower Leaf Glycerite Features and description: ALCOHOL FREE! NON GMO! GLUTEN FREE! Highest Strength Seizure disorders care NON-Alcohol liquid ex..
Selfheal Alcohol-FREE Liquid Extract, Organic Selfheal (Prunella Vulgaris) Dried Herb Glycerite Features and description: ALCOHOL FREE! NON GMO! GLUTEN FREE! Expertly extracted Selfheal ALCOHOL-FREE liquid extract! Selfheal Glycerite contains ONLY..
Senega Snakeroot Alcohol-FREE Liquid Extract, Senega Snakeroot (Polygala Senega) Dried Root Glycerite Features and description: ALCOHOL FREE! NON GMO! GLUTEN FREE! Expertly extracted Senega Snakeroot ALCOHOL-FREE liquid extract! Senega Snakeroot ..
Senna Alcohol-FREE Liquid Extract, Senna (Senna Alexandrina) Dried Leaf Glycerite Features and description: ALCOHOL FREE! NON GMO! GLUTEN FREE! Expertly extracted Senna ALCOHOL-FREE liquid extract! Senna Glycerite contains ONLY natural in..
Senna Alcohol-FREE Liquid Extract, Senna (Senna Alexandrina) Pods Glycerite Features and description: ALCOHOL FREE! NON GMO! GLUTEN FREE! Expertly extracted, Super concentrated Senna ALCOHOL-FREE liquid extract! Senna tincture contains ONLY natur..
Sesame Alcohol-FREE Liquid Extract, Sesame (Sesamum Indicum) Dried Seed Glycerite Features and description: ALCOHOL FREE! NON GMO! GLUTEN FREE! Expertly extracted Sesame ALCOHOL-FREE liquid extract! Sesame Glycerite contains ONLY natural ingredie..
Sevenbark Alcohol-FREE Liquid Extract, Sevenbark (Hydrangea arborescens) Dried Root Glycerite Features and description: ALCOHOL FREE! NON GMO! GLUTEN FREE! Expertly extracted Sevenbark ALCOHOL-FREE liquid extract! Sevenbark Glycerite contains ONLY..
Sha Yuan Zi Liquid Extract, Dried seed (Astragalus Complanatus) Alcohol-Free Glycerite Features and description: NON GMO! Gluten Free! We made this Sha Yuan Zi liquid extract using ONLY natural ingredients! This extract does not contain Alcohol, ..
Shan Dou Gen Liquid Extract, Dried root (Sophora Tonkinensis) Alcohol-Free Glycerite Features and description: NON GMO! Gluten Free! We made this Shan Dou Gen liquid extract using ONLY natural ingredients! This extract does not contain Alcohol, G..
Shan Yao Liquid Extract, Dried root (Dioscorea Opposita) Alcohol-Free Glycerite Features and description: NON GMO! Gluten Free! 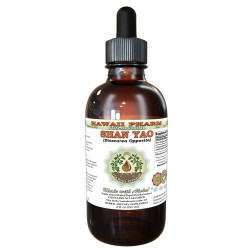 We made this Shan Yao liquid extract using ONLY natural ingredients! This extract does not contain Alcohol, GMO, glute..
Shan Zha Liquid Extract, Dried fruit (Crataegus Pinnatifida) Alcohol-Free Glycerite Features and description: NON GMO! Gluten Free! We made this Shan Zha liquid extract using ONLY natural ingredients! This extract does not contain Alcohol, GMO, g..
Shatavari Alcohol-FREE Liquid Extract, Shatavari (Asparagus Racemosus) Root Glycerite Features and description: ALCOHOL FREE! NON GMO! GLUTEN FREE! Expertly extracted, Super concentrated Shatavari ALCOHOL-FREE liquid extract! Shatavari tincture c..
She Chuang Zi Alcohol-FREE Liquid Extract, She Chuang Zi (Fructus Cnidii) Dried Fruit Glycerite Features and description: ALCOHOL FREE! NON GMO! GLUTEN FREE! Expertly extracted She Chuang Zi ALCOHOL-FREE liquid extract! She Chuang Zi Glycerite co..
She Gan Alcohol-FREE Liquid Extract, She Gan, Belamcanda (Belamcanda Chinensis) Root Glycerite Features and description: ALCOHOL FREE! NON GMO! GLUTEN FREE! Expertly extracted She Gan ALCOHOL-FREE liquid extract! She Gan Glycerite contains ONLY n..
Sheep Sorrel Alcohol-FREE Liquid Extract, Organic Sheep Sorrel (Rumex acetosella) Dried Herb Glycerite Features and description: ALCOHOL FREE! NON GMO! GLUTEN FREE! Expertly extracted Sheep sorrel ALCOHOL-FREE liquid extract! Sheep sorrel Glycer..
Shen Qu Alcohol-FREE Liquid Extract, Shen Qu, Medicated Leaven (Massa Medicata Fermentata) Glycerite Features and description: ALCOHOL FREE! NON GMO! GLUTEN FREE! Expertly extracted Shen Qu ALCOHOL-FREE liquid extract! Shen Qu Glycerite contains ..
Shepherd's Purse Alcohol-FREE Liquid Extract, Organic Shepherd's Purse (Capsella Bursa-Pastoris) Dried Seedpods Glycerite Features and description: ALCOHOL FREE! NON GMO! GLUTEN FREE! Expertly extracted Shepherd's purse ALCOHOL-FREE liquid extract..
Shi Chang Pu Alcohol-FREE Liquid Extract, Shi Chang Pu, Sweetflag (Acorus Tatarinowii) Root Glycerite Features and description: ALCOHOL FREE! NON GMO! GLUTEN FREE! Expertly extracted Shi Chang Pu ALCOHOL-FREE liquid extract! Shi Chang Pu Glycerit..
Shi Chang Pu Liquid Extract, Dried rhizome (Acori Tatarinowii) Alcohol-Free Glycerite Features and description: NON GMO! Gluten Free! We made this Shi Chang Pu liquid extract using ONLY natural ingredients! This extract does not contain Alcohol, ..
Shi Jian Chuan Alcohol-FREE Liquid Extract, Shi Jian Chuan, Chinese Sage (S. Chinensis) Herb Glycerite Features and description: ALCOHOL FREE! NON GMO! GLUTEN FREE! Expertly extracted, Super concentrated Shi Jian Chuan ALCOHOL-FREE liquid extract..
Shi Jue Ming Alcohol-FREE Liquid Extract, Shi Jue Ming, Abalone (Haliotis Laevigata) Shell Glycerite Features and description: ALCOHOL FREE! NON GMO! GLUTEN FREE! Expertly extracted Shi Jue Ming ALCOHOL-FREE liquid extract! Shi Jue Ming Glycerite..
Shiitake Alcohol-FREE Liquid Extract, Organic Shiitake (Lentinula Edodes) Dried Mushroom Glycerite Features and description: ALCOHOL FREE! NON GMO! GLUTEN FREE! Expertly extracted Shiitake ALCOHOL-FREE liquid extract! Shiitake Glycerite contains O..
Shu Di Huang Alcohol-FREE Liquid Extract, Shu Di Huang, Rehmannia (Rehmannia Glutinosa) Prepared Root Glycerite Features and description: ALCOHOL FREE! NON GMO! GLUTEN FREE! Expertly extracted Shu Di Huang ALCOHOL-FREE liquid extract! Shu Di Huan..
Siberian Motherwort Alcohol-FREE Liquid Extract, Siberian Motherwort (Leonurus Sibiricus) Dried Leaf Glycerite Features and description: ALCOHOL FREE! NON GMO! GLUTEN FREE! Expertly extracted Siberian Motherwort ALCOHOL-FREE liquid extract! Siberi..
Sicklepod Liquid Extract, Dried seed (Senna Obtusifolia) Alcohol-Free Glycerite Features and description: NON GMO! Gluten Free! We made this Sicklepod liquid extract using ONLY natural ingredients! This extract does not contain Alcohol, GMO, glut..
Sinicuichi Alcohol-FREE Liquid Extract, Sinicuichi (Heimia Salicifolia) Dried Above-Ground Parts Glycerite Features and description: ALCOHOL FREE! NON GMO! GLUTEN FREE! Expertly extracted Sinicuichi ALCOHOL-FREE liquid extract! Sinicuichi Glycerit.. Skin Care Alcohol-FREE Herbal Liquid Extract, Burdock, O. Grape, Milk Thistle, Dandelion, Stinging Nettle, Yellow Dock, Echinacea Glycerite Features and description: ALCOHOL FREE! NON GMO! GLUTEN FREE! Highest Strength Skin S.. Skin Care NON-Alcohol Liquid Extract, Skin Care Herbal Herbal Supplement Features and description: ALCOHOL FREE! NON GMO! GLUTEN FREE! Highest Strength Skin Care NON-Alcohol liquid extract! Skin Care NON-Alcohol liquid extr..
Skullcap Alcohol-FREE Liquid Extract, Organic Skullcap (Scutellaria lateriflora) Dried Herb Glycerite Features and description: ALCOHOL FREE! NON GMO! GLUTEN FREE! Expertly extracted Skullcap ALCOHOL-FREE liquid extract! Skullcap Glycerite.. Skunk Cabbage Alcohol-FREE Liquid Extract, Skunk Cabbage (Symplocarpus Foetidus) Dried Root Glycerite Features and description: ALCOHOL FREE! NON GMO! GLUTEN FREE! Expertly extracted Skunk Cabbage ALCOHOL-FREE liquid extract! Skunk Cabbage Glycer..
Sleep Care NON-Alcohol Liquid Extract, Sleep Aid Herbal Glycerite Features and description: ALCOHOL FREE! NON GMO! GLUTEN FREE! Highest Strength Sleep Care NON-Alcohol liquid extract! Sleep Care NON-Alcohol liquid extract c..
Sleep Support Alcohol-FREE Herbal Liquid Extract, Sleep Aid Valerian, Wild Lettuce, Blue Vervain, Hops Glycerite Features and description: ALCOHOL FREE! NON GMO! GLUTEN FREE! Highest Strength Sleep Support NON-Alcohol liquid ..